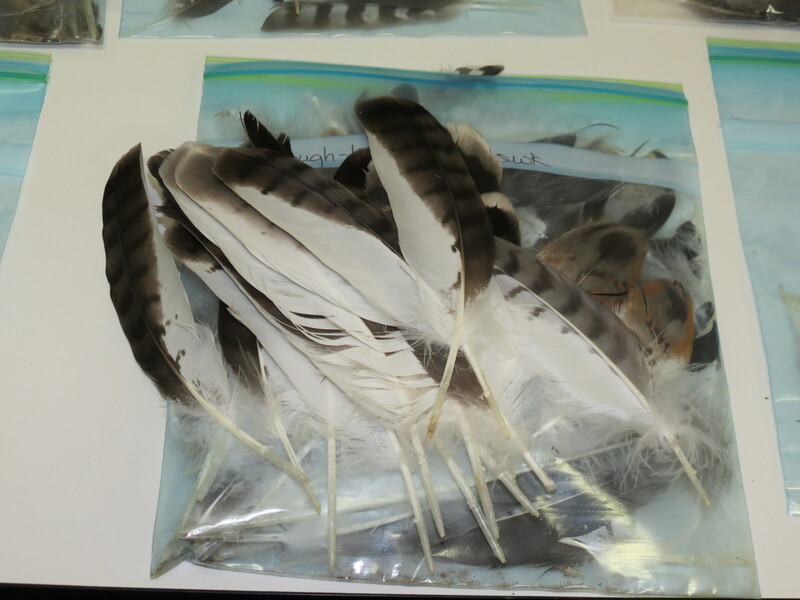 Feathers, feathers, everywhere /Hawks Aloft Inc.
Every year, our education birds molt their feathers, which we then collect. What do we do with all those feathers? We ship them to one of two national feather banks, established for the purpose of fairly distributing them to Native Americans. This is most of our 2012 contribution. Today, Gena Esposito, our Education and Outreach Coordinator, sorted and packed this year’s contribution, getting ready to send to Liberty Wildlife Center in Arizona. 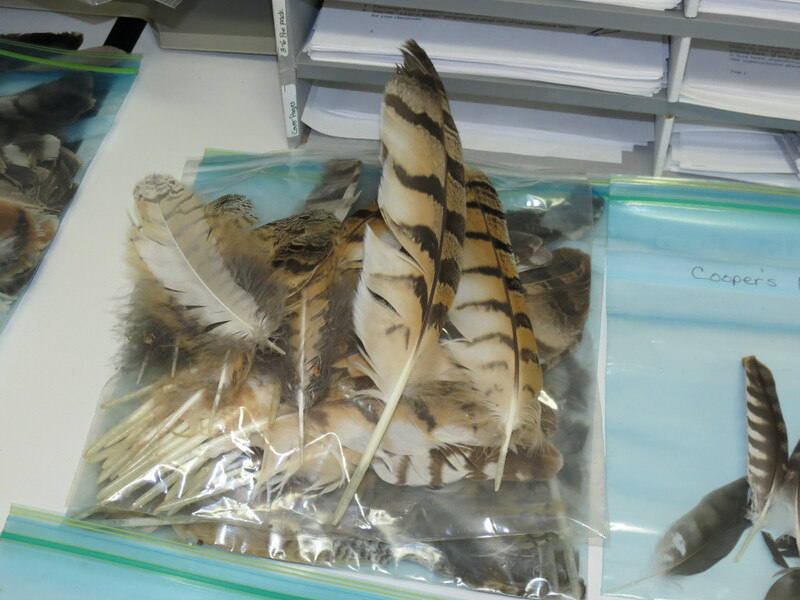 Our 2012 donation to the Non-Eagle Feather Depository run by Liberty Wildlife Rehabilitation Foundation. Ferruginous Hawk feathers are very pale and the tail feathers are a dusky, almost white color. 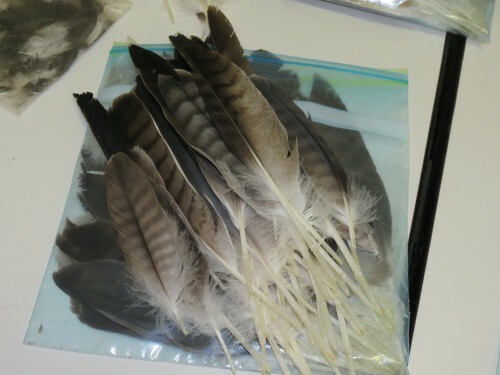 Below are Peregrine Falcon feathers. 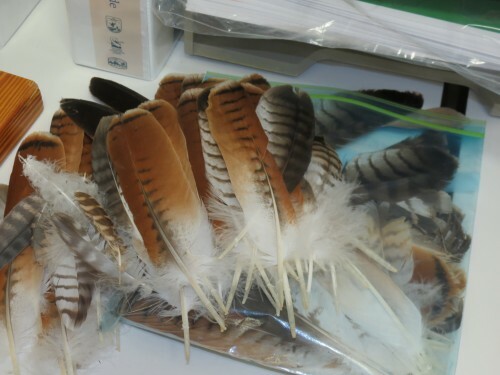 Note the banding on each feather, even the smallest ones. American Kestrels are very colorful. The black and white banded ones belong to our females and the rufous ones are male tail feathers. OOPS! One of these feathers is not like the others. Can you see the dark banded tail feather? It came from our Merlin. Below are Swainson’s Hawk feathers. Note the dark, grayish tones throughout. Swainson’s Hawks are the only North American Buteo that has dark flight feathers when viewed from below. 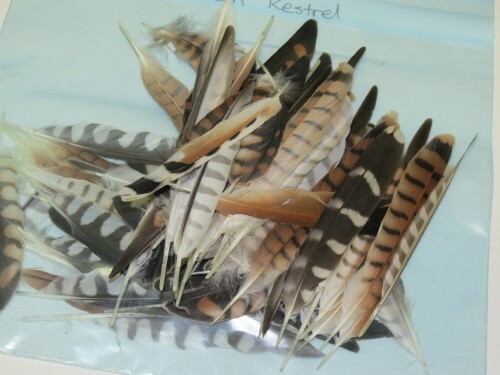 Of course, these are easy to identify – Red-tailed Hawk! Did you know that they don’t acquire their trademark red tails until their first molt at age one? 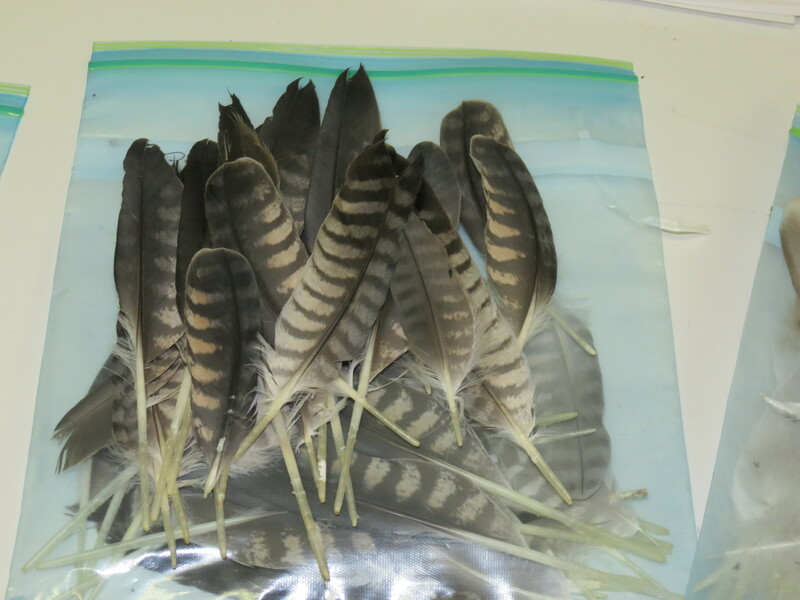 Rough-legged Hawk feathers have a sharp contrast between the light, virtually white side and the dark brownish/grayish side. Very striking. 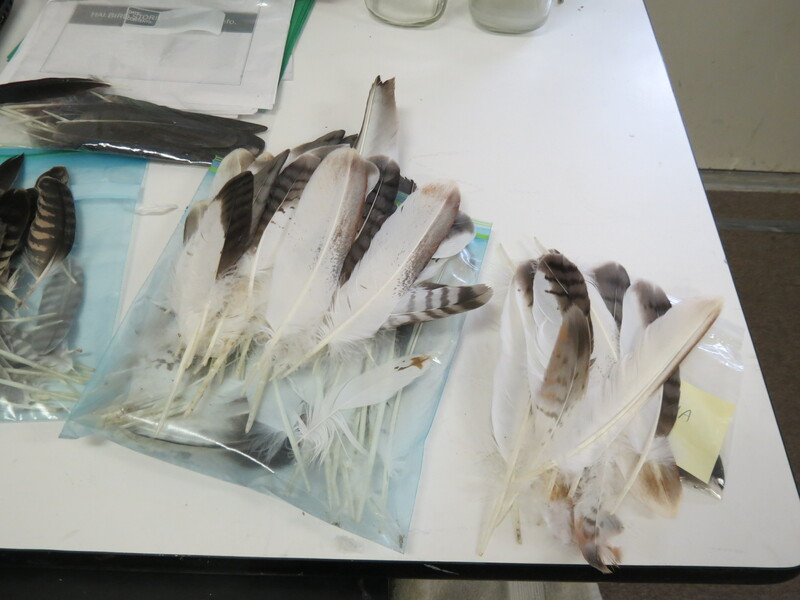 Our Rough-legged Hawk Cimarron provided these feathers. Great Horned Owl feathers are fringed on the edges and along the upper side to enable the owls to have silent flight. 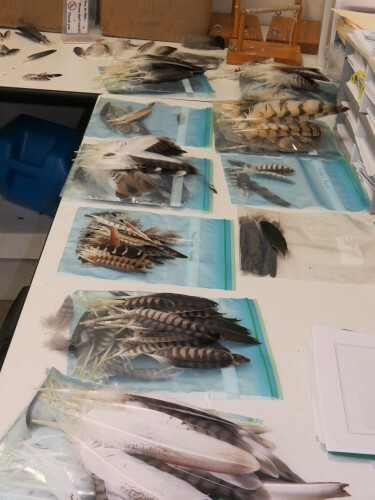 Unfortunately, our permits do not allow us to disperse the molted feathers of our educational ambassadors. We do gather them up and ship them to one of two feather banks. We send ours to Liberty Wildlife in Arizona. There also is a feather bank in Oklahoma, run by the Cherokee nation. They distribute feathers from birds that are not eagles. Eagle feathers can only be obtained by the National Eagle Repository in Colorado. I am a boy who works with griffons vultures since a decade in the north os Spain, and I would like send you a photography to you see how are these vultures of long 2,9 meters of wingspam. So if you send me one e-mail I can send you photography. And I hope to go next year to USA of holidays to see the Condor, and I would like to have some known person in raptors in USA.